Another modern classic that proves the art of creating a lasting drink has not been lost on today’s bartenders. This cocktail was invented by New York legend Audrey Saunders in 2004. Something of a cross between a Mojito and a French 75, it takes in aged rum, lime juice, mint leaves, Angostura bitters and sparkling wine. Having made its debut in this list last year, the Old Cuban has risen six places. 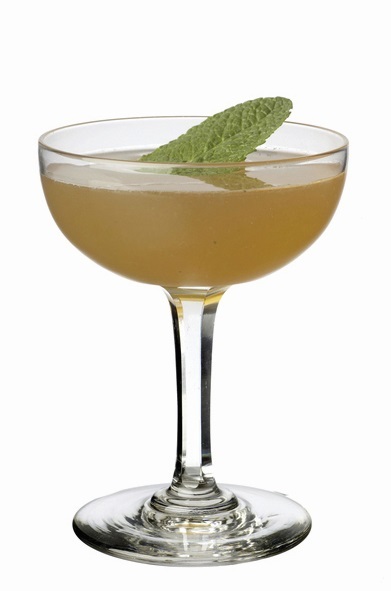 The Mint Julep is waning at the world’s best bars – to think in 2015 it was ranked at number 17. Still, it’s a true classic. This drink is less about the ingredients and all about the preparation. Once you’ve refrigerated the Julep tin for so long it’s colder than the fridge, the drink is almost done. Just add mint, sugar and bourbon and there you have it. At the Kentucky Derby 120,000 Mint Juleps are served each year to race-goers, though not jockeys. That would be dangerous. Whether this drink can revive the dead is a moot point but it can certainly rouse you from your senses. There are many versions but the original is cognac, calvados and sweet vermouth, stirred with ice and strained into a cocktail glass. Harry Craddock recommends you drink one before 11am. But that does depend on what you have planned. A lightweight Negroni, popular among restrained Italians and booze-fearful millennials, is the Americano. Simply sub the gin for soda in your Negroni spec and you have it, the 37th most popular classic at the world’s best bars. A great aperitivo for a sunny and civilised day or an able Negroni stand-in for the drunk customer. Down five places this year. This half milkshake, half Gin Fizz concoction was named after the New Orleans bartender who created it in 1888 – Henry Charles Ramos. The original saw silky-smooth cream and orange flower put a new spin on the fizz. While this cocktail has dropped seven places from last year, you’ll still find the occasional Ramos at the world’s best bars – though cream is sometimes eschewed in favour of a less fattening thickener. The drink of the living dead still has some life, despite slipping 15 places from last year. Pour the contents of your bar’s rum collection into a large glass along with apricot brandy, lime and pineapple juice. Or listen to Martin Cate from Smuggler’s Cove. He uses Jamaican, demerara and Puerto Rican rums, grapefruit and lime juice, cinnamon syrup, falernum, grenadine, Angostura bitters, drops of Pernod and a mint sprig. In Italy peach-marinated wine is a traditional thing, so the Bellini draws on this combination, though not always with fresh peaches. In the top bars, this prossecco drink is often seasonal. It’s up to 34th having not even featured last time out, so it must have been a good year for peaches. We won’t bother with a recipe, as there are only two ingredients. We will bother to say in 7% of bars this was a top-10 classic and in two bars the top seller. Most bartenders agree the story is pedigreed but the drink a crossbreed – the mongrel sort. That said, this vodka-gin-Lillet Martini yanks a chord for some punters, particularly those who like James Bond films, a character from which the cocktail was named. It’s a bit of a neither-here-nor-there drink but it’s up nine places from last year with one bar from our sample claiming it ranks as its best-selling cocktail. One of three Scotch drinks on the 50 Classic list this year (a record), the Rob Roy is a Manhattan with a Scottish accent. The scotch offers a bit more subtlety to proceedings and, in tandem with the Angostura bitters, pulls up its kilt to the sweet vermouth. Bartenders often use a scotch with peat, for a bit more fight. But the standard recipe, from the Waldorf in 1894, just asks for blended scotch. Somewhere between cool and uncool lives the Piña Colada. Right now it’s in a cool phase with bartenders in cocktail capitals giving it a revamp. Piña Colada means ‘strained pineapple’ and harks back to the first rendezvous between pineapples and rum. Coconut then at some stage got in on the action in what is the vaguest history of anything ever written. Having fallen off the list last year, the Piña Colada is back in the bars’ good books.